Notable features of this item include its umami-laden bacon and its flavorful, creamy sauce. Spaghetti carbonara is an Italian dish which typically includes bacon, cheese, and eggs. The origin of its name is somewhat of a mystery. 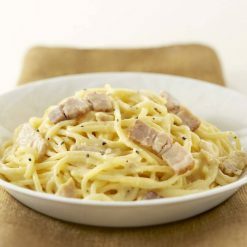 The minced bacon mixed into the sauce of our spaghetti carbonara gives it an especially rich, velvety flavor. The bacon used is itself a Sugarlady item, and is made from pork that does not contain therapeutic chemicals or antibiotics. Sugarlady’s frozen spaghetti and other frozen meals make enjoying your favorite foods quick and easy, even on the busiest of days! Because this item is pre-seasoned and frozen together with its sauce, it can be ready in mere minutes. It is also compact in design, and will fit easily in your freezer until needed. To microwave: Place the spaghetti carbonara (still frozen) in the microwave. The side of the bag with a steam vent should be facing up. Do not cut any additional holes in the bag. In either a 500W or 600W microwave, cook for 4 minutes 30 seconds.To boil in bag: Place the spaghetti carbonara (still frozen, still in its bag) in an ample quantity of boiling water. Cook for about 7 minutes.This item is great for a quick meal after work or school, and can even be brought frozen to the office and made on the spot for an easy, delicious lunch! 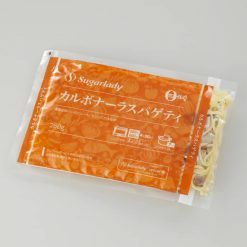 This product contains paghetti (durum wheat semolina), bacon, concentrated fat free milk, onions, vegetable fats and oils (rapeseed oil, olive oil), processed egg yolks (egg yolks, reduced sugar syrup, table salt), whole milk powder, natural cheese, white wine, table salt, potato starch, sugar, chicken extract, garlic, spices, yeast extract, thickener (xanthan gum), gardenia yellow..